A friend and client referred us to his son, who needed some work done at his North Raleigh home. 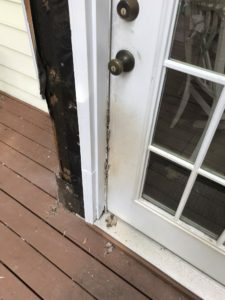 More specifically, the bay door opening to their back deck was in pretty bad shape and needed replacing. 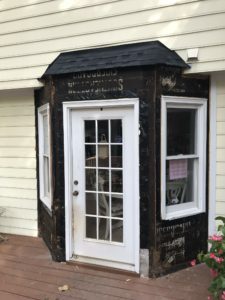 But this would be more than a simple door replacement; pretty much everything in the bay — except the windows — needed to be replaced: Trim, siding, door, hardware. 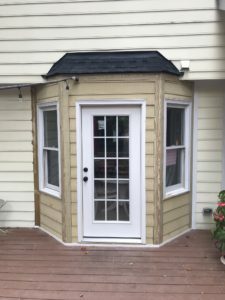 After getting a deposit from the client we ordered the materials (thick decking board for trim, 1/4” HardiPlank siding; door trim for interior), and put work on the calendar. Again, fairly straightforward, but we made other improvements, such as fashioning a bottom border (in contact with the decking) out of weatherproof PVC. This will go a long way in the longevity department; water pooling on the deck will no longer be in contact with the siding and trim. We also applied some Bondo to parts of both windows that had a little rot and sanded it smooth, as well as replacing part of a window sill was rotted far beyond a Bondo fix. 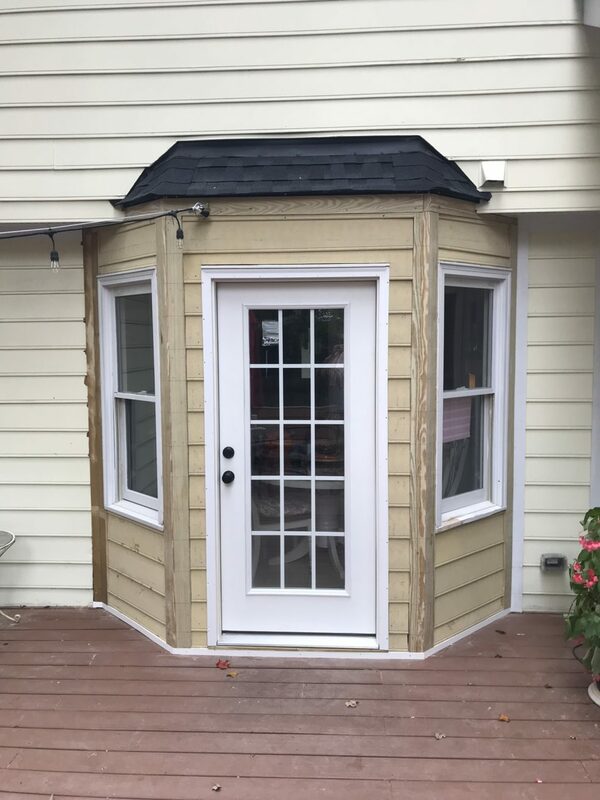 Although the old door hardware was in decent shape, the clients wanted new knobs and deadbolts for this door, and a sun room door nearby. So we went up to Lowe’s and got two sets, in Oil Rubbed Bronze. The clients love the new look. Finally, we replaced about 5 pieces of siding on the side of the house. The client and his father — who referred us — are very happy with the work. They are getting a round of painting done at their house in a few weeks, so I’ll post pics of the freshly-painted nook once it’s all prettied up. Another great job; another happy client!